PinPoint Gospel Tracts is a group of nobodies, striving to tell everybody about THE SOMEBODY who came to save sinners. Simply put, we are just Bible Believing, Bible Obeying, Born Again Christians. We are committed to providing the best quality product possible. All of our Gospel Tracts are printed on the best quality card stock and paper, are full of color and most of them have a glossy finish on them. We can even create a custom gospel tract for you. Check out our Custom Gospel Tract page for more on that. 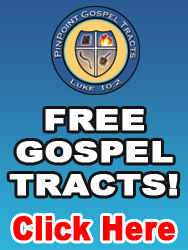 Besides gospel tracts, we also offer gospel signs, gospel sandwich boards, preaching t-shirts and preaching hats. We even offer artwork to put in your home, that will remind you to be a witness to the lost when you leave your home! All of the categories of what we offer, can be seen in the menu to the left. We pray that we can be a blessing and a help to you as you sow the seed of the Gospel, for the glory of God. Now get out there and spread the Gospel to as many people as possible!